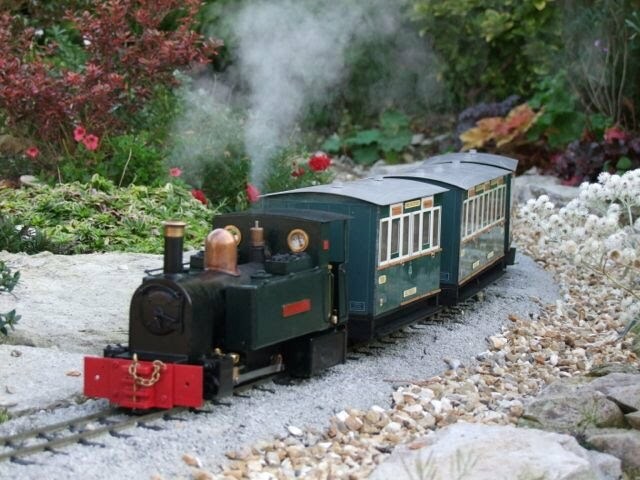 First Version: Launched in 1982 this 0-4-0 had an open cab, no detail on the smokebox door, pannier meths tanks, a chimney set off-centre on the smokebox, small cylinders and a regulator mounted on a piece of copper pipe. 32mm only and the body is tinplate. 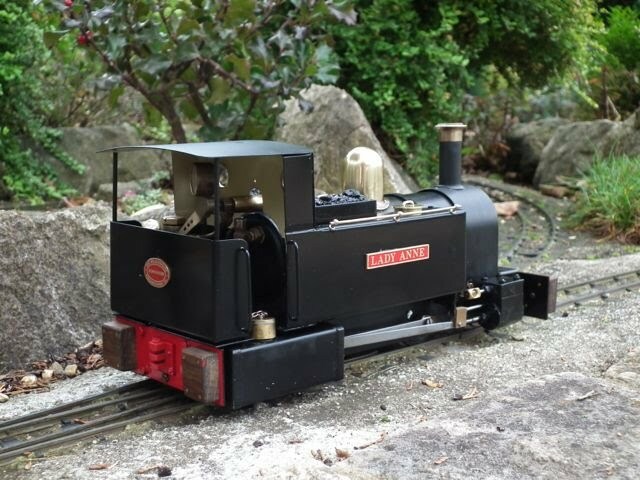 Second Version: Launched in 1983: Still 0-4-0, but now with a cab (the back is removable) and smokebox detail. The regulator is now mounted on the turret at the back of the boiler. Cylinders are still small and it is still 32mm only. This is the version described in this article. Third Version: Still 0-4-0, but the frames are now wider apart and the body is wider to allow a 45mm version. 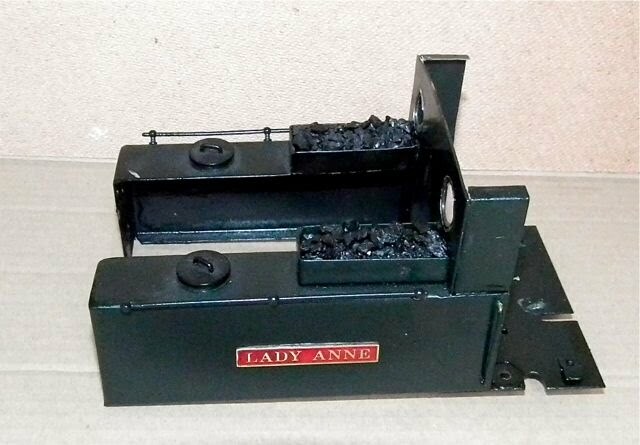 The obvious change is the small angled part at the base of the smokebox and the fact that the meths tank is now between the frames. it still has the small cylinders. I took this photo back in the mid 80's and I believe it shows this version. This one is radio controlled, but the cab looks very crowded! Fourth Version: Launched in 1984 it is still 0-4-0, but now the loco has the larger cylinders and the body is etched brass instead of tinplate. 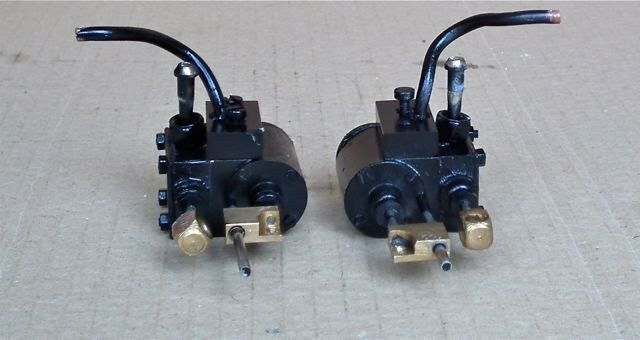 The crossheads are now whitemetal instead of brass and the flycranks are steel instead of bronze. Here is John Wenlock's fourth version - there is more information on this on the 16mm Association website here: http://www.16mm.org.uk/newsite/motm/mom2009-08.html Note that the article incorrectly refers to it as the second version. Easily done! This model was the second version produced by Roundhouse in 1983 as described above. 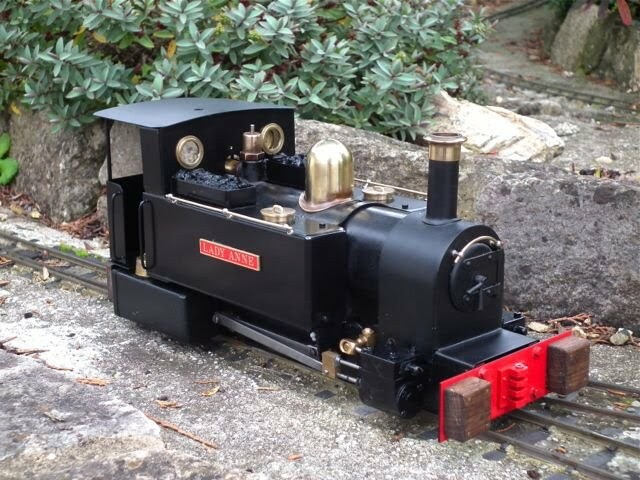 Here it is, as purchased from Alan Whitaker of PPS Steam Models in September 2008. I decided to leave it pretty much as it was. I did make some oak dumb buffers for it, but left the vastly over-scale multi-height coupling in place. After that she went back in the cupboard until October 2012, when I decided on a quick re-paint. In fact I had only planned to change those couplings for some more sensible ones, but once I had started, I just could not let the peeling Hammerite paint finish remain. The body was easy to remove with a couple of screws at the front of the tanks and two into a frame spacer under the cab. 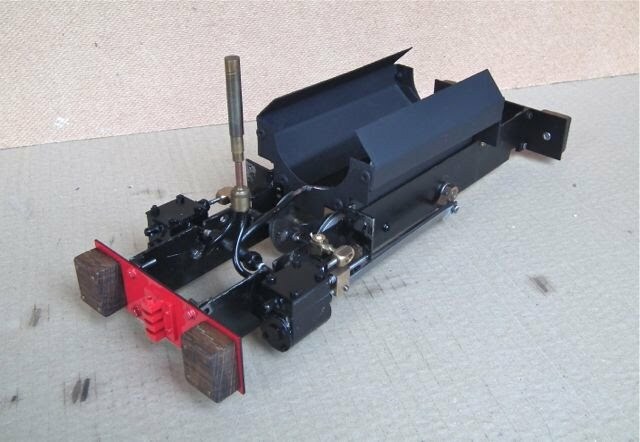 The meths burner was screwwed to the rear buffer beam and had a support between the wheels. The roof and rear cab sheet just unclip. The chassis looked like it had 29 years of accumulated dirt. It has surprisingly little wear, but I have only run it half a dozen times in the past four years. These early locos were not very rigid, and it only took a few lifts by the tanks (rather than the buffer beams) to bend the tanks in at the top. This loco suffered from this effect so I decided to add a brace at the front of the tanks, as I did with the 1985 Charles Pooter. 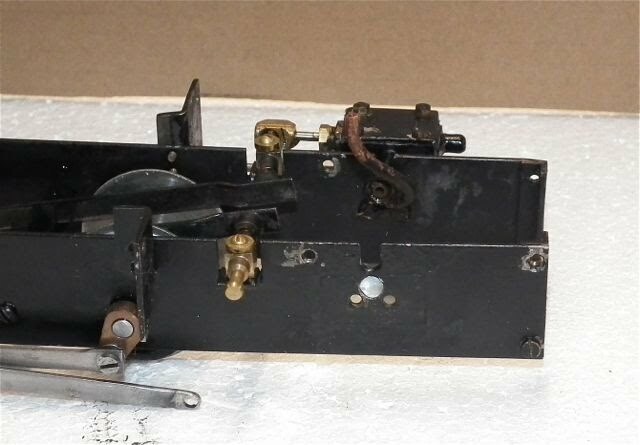 The trouble was that I didn't have any of the right thickness brass strip in stock, so I used a piece of brass bullhead rail (left over from track laying in 1985!). 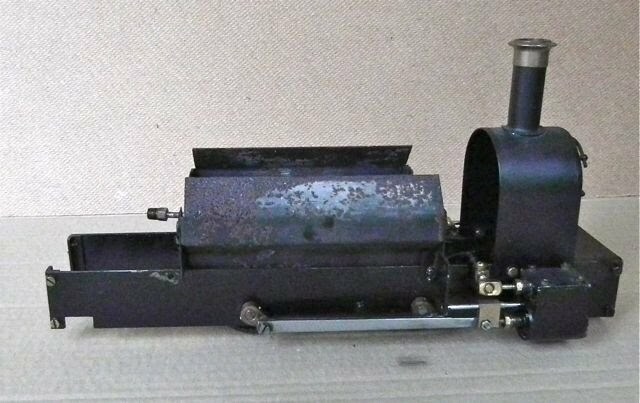 I filed the top flat and then re-assembled the body on the boiler to get the curve right. I then drilled and tapped it 8BA and fitted in position. 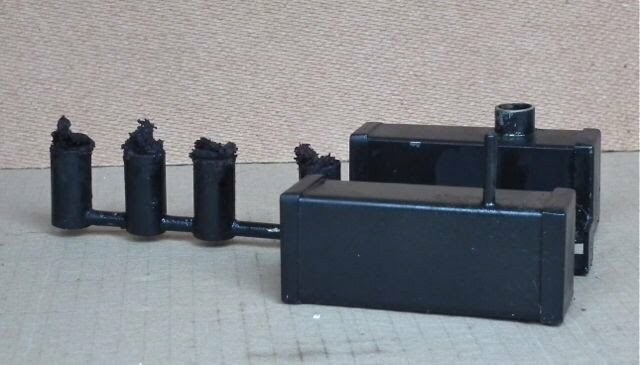 There were large gaps at the front edge of the tanks, so I filled these with car body filler and then I re-soldered a couple of the handrails to make them parallel with the body. They are pretty crude, but I decided that this was part of the character and so didn't replace or re-bend them. After that, the body was rubbed down with fine wet and dry - I did manage to remove some of that unevenness on the tank tops. Then I degreased with thinners, etch primed the brass and used ordinary car body grey primer on the rest. It then had a bake in the oven at 80 degrees before spraying with Halfords acrylic satin black. When I started this, I had thought I would keep all the brasswork (other than the spectacle rims) painted black, to maintain that industrial look, but then I realised that this hid some of the heritage features - and after all, this is a pretty rare beast. The brass tank fillers were a feature (they became white metal soon after) so I decided to polish them for all to see. The handrail knobs of this era were plated and so again I decided to leave them visible. The nameplates had been stripped as they were epoxied to the tanks, so I gave them a dusting of etch primer and sprayed them red. I have been influenced by Tag Gorton to think that cabs should be cream, at least above the waistline, so I masked the inside and gave it four coats of Humbrol matt cream enamel. And here it is put back together. The fillers, spectacles and nameplates are all stuck on with clear silicone. The back of the cab had the same treatment, but it was an awkward thing as it all needed to be painted and there was no easy way to support it. For the final baking I placed it, inside face down on a fresh block of softwood (it is important that it does not contact any paint as it will fuse. What I didn't realise was that the wood had a resinous crack which gushed resin onto the paint. White spirit removed it, but took the paint off too (a strange phenomenon with this thinners based paint). So that had to be done again! 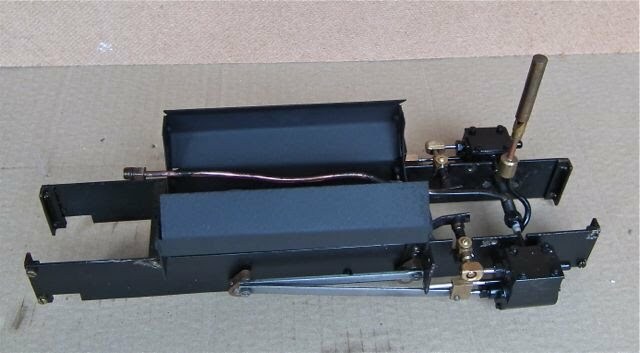 To remove the firebox, it is necessary to remove the superheater pipe, and to do this, one of the cylinders has to be loosened (two screws on the inside. It is important to support the T section when undoing the glads or it will distort. With these removed, I was able to degrease and clean everything with engine cleaner and a hosepipe (outside!). I then did a lot of head scratching, as the cylinders will not come off. There are two pipes going through two holes in the chassis and they cannot be withdrawn through these holes. The answer is to undo the steam chest cover and then remove the steam chest with its pipe. The cylinders can then be removed. On the Charles Pooter that I restored, someone had joined these holes to make removal and re-fitting much easier - so I did the same on this. I decided to just touch up the chassis as necessary rather than re-paint it. The firebox was wire brushed, degreased, rubbed down and painted with matt black BBQ paint. I also decided to leave the boiler and smokebox as they were. 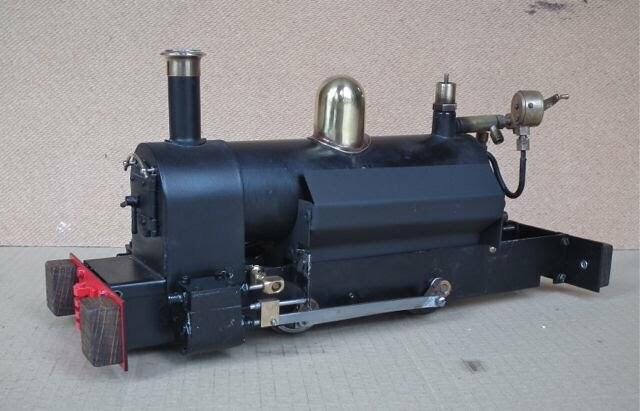 When restoring Charles Pooter I found that the boiler was incredibly difficult to strip and regretted starting it - so I took the easy option and gave it a good clean before touching up a couple of chips. 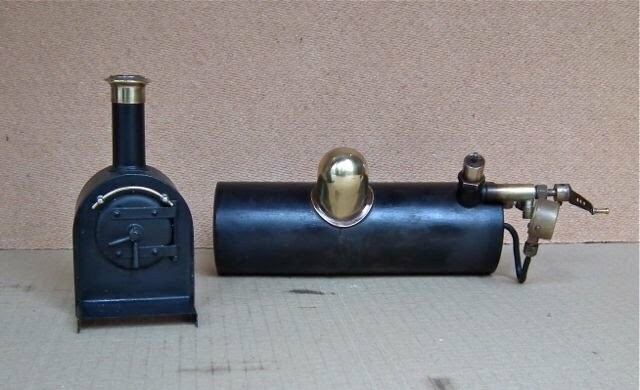 I had decided to leave the smokebox too, as I rather liked the black handrail, but then I spotted that it was easy to remove (nut on the back rather than tapped as the modern ones are) so five minutes later it was stripped and polished to reveal the plated knobs. The cylinders were working well so I did not strip them right down. I could see that the slide valves were in good condition and the surface was hardly worn at all (unlike Charles pooter). I did have to make new gaskets for one cylinder. I cut these from a heavy duty brown envelope and oiled them before fitting. With them both back together I was able to strip them and prepare them for etch priming and spraying satin black. I made two small holes in a piece of wood as stood them on their slide bars so that I could mask the piston rods etc. As usual I used Blu-tak on the pipe ends. I had made wooden dumb buffers some time ago, but the multi height couplings (though full of character) just had to go. I fitted some white metal ones I had in stock, after cutting the rear one to allow it to clear the burner fitting screw. I re-sprayed the fronts Ford Radient Red and the backs matt black. With all the bits sorted, it was back to the bench to begin re-assembly. It is quite straightforward - with the emphasis on "quite"! First the cylinders go back on, and to do this the slide bar bracket needs a screw removed so it can swivel. 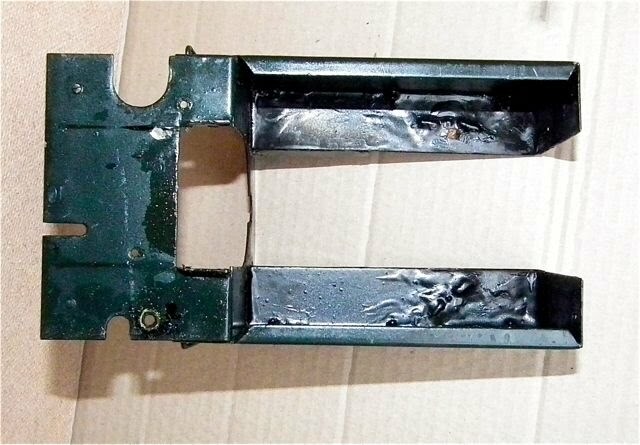 Then the connecting rod has to be screwed to the inside of the crosshed with a touch of Loctite. Then the cylinder is slid into place and the slidebar is located in the bracket which is screwed back in place. At this stage I decided that the two screws holding each cylinder were too short and too awkward to get at. I made some small head 6BA bolts to length and then discovered that I could not get them to bite in the thread. I cut a slot in the top so I could start them with the pressure of a screwdriver and then tighten them with a spanner. If I had not slotted the frames, this would have been a total nightmare as the cylinders would have been in three pieces!! Here are the cylinders back in place and with the Summerlands Chuffer fitted. The rocking levers can be seen here - they are screwed to brackets with a top hat brass bearing held in place by a screw. 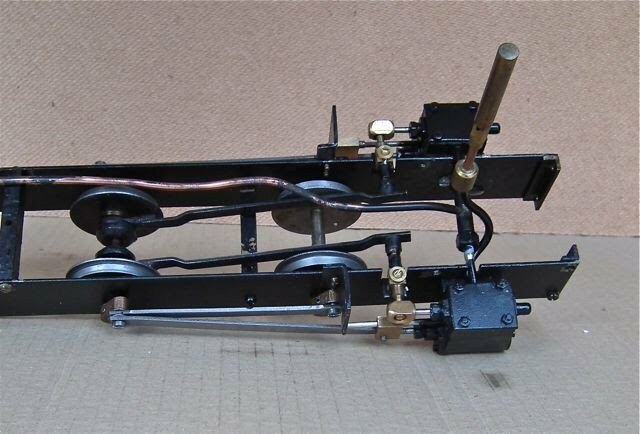 I then fitted the buffer beams - a simple enough job, but the removal of the larhe couplings meant that a number of the bolts were now too long and fouled the brackets. I had to cut them very short. 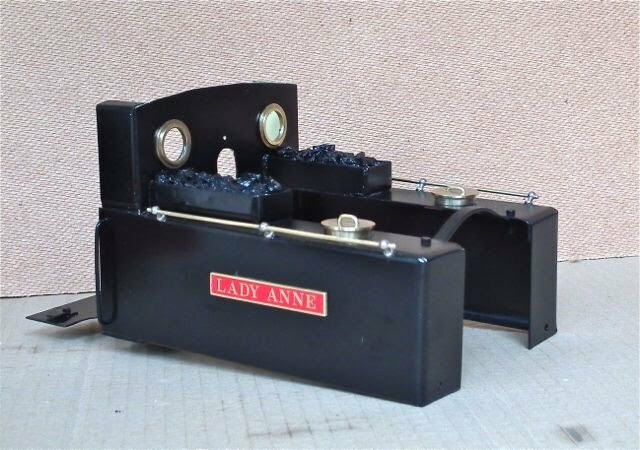 The boiler just sits on the firebox and is held in place by the smokebox, bodywork and plumbing. There is no clamp or screw. And so on with the body, which is held under the cab by two screws into a frame spacer and by two through the tank fronts and the slidebar brackets. These latter were awkward and I scratched the paint - so the ever present touch up brush was used. Next the plumbing - just a matter of doing up two unions for the lubricator - after the boiler had been jiggled a bit. 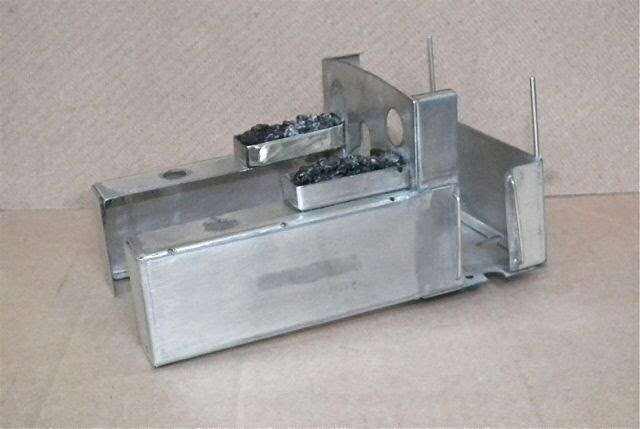 And finally the burner - which looks like this. The wicks look a bit ragged, but I have never touched them and don't intend to as they work perfectly! I said the at timing may have altered - and it certainly had! In fact I think I must have put a slide valve in the wrong way round (it looked symetrical to me!) as the cylinder I had to make the gasket for was way out. It locked up when I tried it on air (just a cleaning gun on the compressor line pressed on to the safety valve hole). So it was valve covers off and then the awkward job of releaasing the rockers before adjusting....and adjusting....and adjusting. Each time it has to be re-connected to the rocker and then I just do it by eye until I have an even hole opening each end of the valve travel. It then ran fine on air so time to find the meths and fire her up.